As an innovative company, our main objective is the innovation and improvement of the material density measurement technique. Our sight does not stop only at polymers or rubber. Currently this measurement is done through the use of gradient columns. It is necessary that within the tube, in which the material to be analyzed is immersed, density gradients are formed between two liquids with different densities that are very dangerous for human health: 1,4-dibromobenzene and bromobenzene. The liquid in the tube should also rest one night before being used, so that the liquids will spread into each other to form a gradient. Not only that, it is also necessary to control the temperature of the liquid (and in 2mt high columns it is very difficult, above all because it is influenced by the ambient temperature) because as you know the density of a material is influenced by the temperature in which it is immersed. And if it is just that fragment of glass that could exonerate you? Would you trust an analysis conducted with this technique? It is not accurate, it is not repeatable, it is not sensitive, it is not precise, it is not fast but above all it is purely subjective! 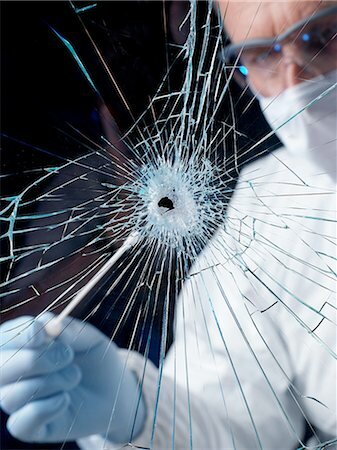 Today this is the technique used to measure the density of glass fragments found on the scene of a crime. The article on the FBI page will certainly clarify this aspect. We are sure that we are not mistaken if we believe that our system could represent a real revolution in this field because it is completely automated. The measurement is completely objective and the results are in real time thanks to our Density Manager Software ®. It has a precision that is around 0.01%. Furthermore, 16 samples can be analyzed in sequence (150 seconds per sample). On our youtube channel you can see how our MVS2Pro Density works! This entry was posted in News and tagged automated, density, glass fragments, gradient columns, MVS2Pro Density, precision, real time. Bookmark the permalink.